In a recent a OnePoll survey commissioned by Comparitech.com, nearly two-thirds of Windows users say they would definitely consider or might consider switching to Mac due to privacy concerns. OnePoll questioned 500 people in the United States and 500 in the UK. The poll asked each of the Windows users if Windows 10 collecting user data that raised concerns about their privacy would make them consider a switch. 14.1 percent responded definitely, and 50.1 percent said it might. the Windows Store authentication, which allows users to set a 4-digit PIN in lieu of a password, does not restrict the number of attempts to enter the correct code. All of these issues set off alarms among privacy experts shortly after the operating system was released just over a year ago, so while France’s order is new, the problems with Windows 10 are not. 67 percent of UK respondents said they would definitely (15.2%) or might (51.8%) consider switching to Mac if privacy concerns about Windows 10 data collection were raised. That’s significantly higher than Americans, according to our statistical analysis, 61.4 percent of whom would definitely (13%) or might (48.4%) consider a switch. Does age play a role in how much you value privacy? Users aged 18 to 24 years old were the most likely to definitely consider switching according to the OnePoll and Comparitech survey. 71.74 percent say they either would definitely (23.91%) or might (47.83%) consider switching to Mac. The 35-44 year-old age bracket had the fewest number of loyal Windows users who wouldn’t consider a switch at all, 24.46%, compared to 28.26 percent in the 18-24 bracket. As the age of respondents increased, the chance of them being swayed by privacy concerns decreased. Among Windows users aged 55 and up, 56 percent said they would definitely (9.3%) or might (47.09%) consider switching to Mac. Statistically speaking, however, the difference between each of the age brackets was not significantly different. Even though we see a slight trend in the survey data, we cannot generalize it to the entire population. 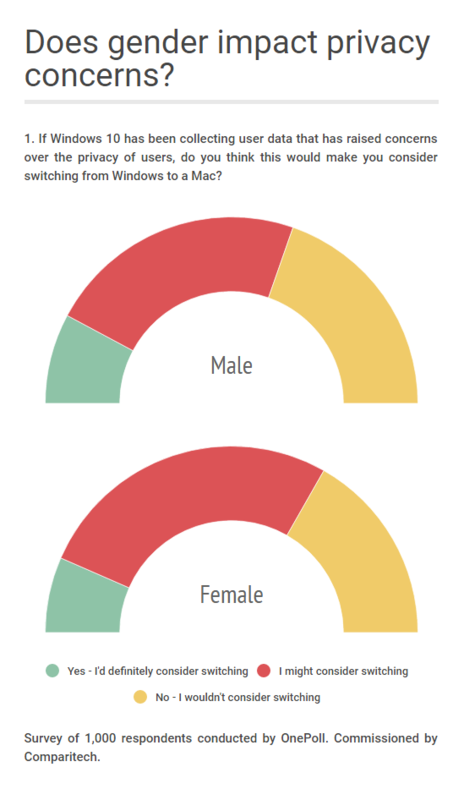 Men are more likely than women to rule out a switch to Mac despite privacy issues with Windows 10 (39.29%), however more men also say they would definitely consider a switch (15.62%). Slightly fewer women say they would definitely consider buying a Mac (13.10%), but fewer would rule it out altogether (33.5%). On the whole, the sentiment toward Windows 10 privacy issues and the impact on future purchases pretty much evens out between and women. According to our statistical analysis, gender was independent of survey response. Note: Our statistical analyses each used Pearson’s chi-squared test of independence with the significance level set at .05. Related: See our guide to the best VPNs for Windows 10 here.